If we think that only the government that took the campaign Let's live green and help save the environment, it is safe and clean environment can not be obtained. 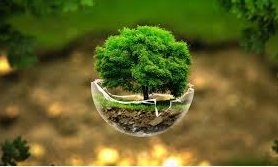 All citizens, all elements of the community must come together to help realize a good environment that is heading back natural green environment, fresh and fascinating refreshing. Set the glass windows and fentilasiBy arranging the glass windows and fentilasi good you will save the cost of electrical power consumption. The room will still be able to direct sunlight, also get fresh air circulation is sufficient. Using solar powerThe sun is the energy source of very great and free in nature. We can harness the sun's energy many applications. We can harness solar energy into electricity. Manually drying clothes in the sun in the appeal wears clothes dryers although longer drying stage. Reduce the use of light in the houseUse of the lights in the house are usually very exaggerated, all the lights turned on. This resulted in cost is not cheap and the electric energy spent is paid and paid dearly. For it to generate electricity use less then after the lamp is turned off immediately kembali.Gunakan only as needed. Limit your use of kendaaraanYour vehicle usage should be restricted so as to make environmentally friendly. If necessary, use of electric vehicles instead of oil. It will save oil resources. When using the vehicle if necessary, use of environmentally friendly fuels such as fuels derived vegetable oil or bio diesel. Bio diesel barasal from crops such as oil palm, maize, cassava, and others. Use of bio-diesel fuel is more environmentally friendly and does not make the oil quickly exhausted. Use of the vehicle is used only as needed, when they are away close to not have to use the vehicle. Walk will be to make the body healthy and fit. Heart disease will not grow to a person who often sports especially healthy way. The point is to use as much as possible the natural resources that are readily available in our environment. Such as installing solar panels, bio-gas processing of livestock, making hydroelectric power generator or a micro hydro generator also wind power. Governments and citizens unite to help the realization of a green environment. It can not be done by government alone but all citizens must be involved. Not the exception from the family father, mother and children we need to let us know about healthy living a happy life. Let's living green and help save the environment.